TFV. This should be good. Good luck guys! @thatguywithheadphones: Then I'll wait in anticipation. I'll spare you Guts's life story and just jump into what is "in character" for him. If I had to sum it up in one word, it's be "visceral". When in combat, there are no morals and no holding back for Guts. There's no non blood-lust for him either, just varying degrees of anger. This means he has no qualm with killing,maiming, or whatever, he fights to kill and does it as effectively as he can. As Guts himself has put it, he's human down to the marrow in his bones, don't ever compare him to . . . than he says some other stuff that I'd get banned for reciting. The point is that Guts doesn't have any inhuman powers or abilities, despite that he's still blatantly superhuman thanks to his . . .
Superhuman Speed - Not only is Guts capable of moving his sword at insane speeds but he can also react and maintain combat at this speed level for an immense amount of time. Inhuman Stamina - For the vast majority of all the scans I'm going to bring up, Guts is suffering from a severe case of sleep deprivation. For 2 years Guts has been hunted by demons and spirits who attack specially at night, while dealing with humans and continuing his quest during the morning meaning he sometimes has spent whole days and nights just killing and preparing to kill. Superhuman Endurance - Guts can take a beating likes no one's business. From falling off a high cliff at 8 and still being able to kill a pack of wolves to cutting off his own arm after fighting demons(with a several broken ribs). While not explicitly trained in specific styles or forms, Guts has been training in sword-fighting since age 5 and fighting in wars since age 8 (Guts himself is about 22). During his tenure on the battlefield, Guts has both earn reverenced for his skill and has killed others who has been held in high regard as well. The centerpiece of Guts's arsenal & combat: a near five foot long broadsword or iron and steel. Thank to 2 years of murdering demons the swords has gainws certain special properties. Rapid Fire Crossbow - Perched on his arm, Guts carries a crossbow that shoots bolt and arrow in a rapid fashion. A mystically forged armor that increases Guts's physicals and give him a "healing" factor( it just forces his bone and muscles together and violently shoves steel into him so he can just keep on fighting. Often used as a let resort or when Guts is too close to the enemy, Gut's false arm is able to fire off a single cannon ball round. He usually comes equip with 3 or 4 balls to fire. One of the very first thing I'd like to consider when debating with Guts, especially against melee fighters, is his swords size. Thanks to it's impractical length, Guts sword makes for a somewhat awkward combat situation for his opponents. To get to Guts have to bypass his sword's reach which is about 9 feets(this is including Gut's arm length) that's easy said than done, thanks to Gut's speed and tenacity. Now while I wouldn't dare try to debate Guts as out of Danny's league in speed, it isn't just he speed that makes him a hassle it's the tenacity. Once Guts start moving his blade, he doesn't have to stop, he can keep going, and going, and going. . .
What's even better is that even while such a bladed frenzy, Guts's is still capable of environmental analysis and skillful, complicated movement. He's very much like a machine gun, except the bullets are 300 - 400 pounds and the magazine goes on for as long as it needs to. This level of consistency will be Danny first hurtle to pass. @thatguywithheadphones: Sorry to interrupt but what about his crossbow that he usually has attached to one of his arms? Totally forgot about that, thanks. Interesting match up. Tag me. Yeah, thinking about it, I probably gimped myself a little too much. @mr_ingenuity, you mind if I count in the Berserker armor? @thatguywithheadphones: Not a problem make your edits. @thatguywithheadphones: This should be interesting. Although I would argue against the handbook's statement of peek human. As Danny feats should be considered at least enhanced if not superhuman. While lifting strength feats are few and far between Danny's striking strength is where he excels. One shot a Mech with an uppercut. Strikes the ground hard enough to topple a giant robot. Danny's Iron Fist overpowers Thunderball's magically enhanced wreaking ball. Hits hard enough to one shot Ragnarok (note the third page). Ragnarok is a cyborg Thor clone while not in Thor's strength class having been one shotted by Herc, it is stronger than Luke Cage. Danny has very noticeable speed. And form the feats he's demonstrated over the years I would consider him among the fastest street level characters. The thug though he was being tough by stating "Lesee if you can out run a bullet!" Which Danny nonchalantly bullet times. Although bullet timing is a causal feat for Danny & any character in his tier. But I'm incline to state Danny's speed is more consistent than most characters. Having outpaced a bullet as early as the 70's. Also outpaced a point blank bullet as recent as 2015, & in the process saves someones life. Danny is capable of maintaining this level of when the need arises. However that level of speed wouldn't be impressive if Danny couldn't uses it where it counts most. So a demonstration is in order. Note this display is done under water making it slightly more impressive. Danny's most common displays of durability comes in the form of explosive & blunt force durability. However his chi does give increase resistance against heat/radiation & piercing/slashing weapons. Chi doesn't only increase stats (as shown above) it also increases Danny's senses. Also grants him increased healing, although negligible. Also chi can be used as a weapon. @thatguywithheadphones: Excuse the post, I know you're making edits, but I didn't have time to post it later. I would have added a strategy but short on time. I wasn't making any major edits just some slight info on the armor. Post incoming in a few hours. My primary concerns lie solely on Danny's Chi. His strength, speed, and durability can be matched and maybe exceeded by Guts, but we'll get into that later, Danny's Chi, particularly his offensive use of it, is what make him truly dangerous, but even with this advantage, there are still things to consider like . . .
Now, I'll admit to somewhat slacking on my Iron Fist reading, (I'm about half way though Luke and Danny's first book together along with some peaks into the future here and there.) but one of the thing I remember is that Danny can't just spam his Iron Fist or chi related techs in a single fight, IIRC the explicit number was 2 or 3. Going by my experiences with the character again, Danny mostly starts with non-enhanced martial arts. While It doesn't take much for him to use it, there's still a escalation factor present which wouldn't bode well against Guts, because he goes 0 to 100 real quick. Here Wyld has shown the he's capable of shatter a falling boulder with just a casual uppercut. Later, Guts is not only able to continue fighting after taking several hits from Wyld in a stronger form, but he's also able to retain his consciousness long enough to be able to think of an intricate trap to beat the best. So even if Danny start to use his muti-ranged chi attacks, Guts can mostly likely take them on. There's also the fact that he can just dodge them, even block them with his sword. Danny's has bullet timing reactions, good, he'll need that especially consider Guts's reaction speed is on par with that thanks to the feats he displayed against the demon Rosine where Guts was able to rise his sword and make it switch position while she was in the midst of bull-rushing him;It's worth noting that Rosine's bullrush was breaking the sound barrier. This also doubles as an example as to how much damage Gut's blade can take as it was all able to take a full rush from the same demon without a single scratch. Gut's is matched against enemy how could match his sword speed. Instead of continuing to fight under these condition's Guts starts to incorporate his cape into the fray. much, much later, when Guts is matched up against an enemy whose agility make him too much of a hassle. To compensate, Gut uses his timing, gear, and sword's durability to effectively destroy his enemy. I choose these two example in particular because a lot of the others Guts relies on the terrain or setting, and I feel like these two are the most relevant against Danny as his speed matches Guts and he relies on his agility in combat. - Danny's slight restraint when it comes to chi based attacks may cost him, as God starts off hard. -The reaction and combat speed shown aren't interchangeable with fighting Guts. - Guts's innovation and full use of his arsenal maybe able to distract or discombobulate Danny enough for Guts to get in some devastating strikes. I'll start with Danny's standard morals. Since it's the crux of how Danny fights. Danny while a hero is still a fighter & innately a warrior given his title. So holding back is to avoid unnecessary death. But when it comes down to Danny's life or his enemies his priority is clear. I present Danny's on panel statements as evidence proving consistency. "I wasn't aware there were any rules...or that you believed in any, Davos." "I've never deliberately lost anything in my entire life. That's not the way we do things in my line of work." "Well, if that's how it wants to play...might as well go down swinging." Moving on as this morals isn't the focus of my post, also not the determining factor to win a fight. When pairing characters with high levels of strength, speed, striking power the determining factors are precision & skill. Due to honed senses & reflexes Danny's strikes are naturally precise. Which are very useful traits when unable to see the approaching threat be it weapon or enemy. Such as the time he intercepted Sue's BO Staff based on shifts in the air current. It has allowed Danny to perceive his enemies well enough to instruct someone to safety & grab a sniper round. Also Danny's senses & reflexes are shown capable to the point he fought while temporarily blinded. However this isn't to be mistaken as me stating Danny awareness in enough to fight a strong opponent blind that's absurd. Through that training & years of experience Danny is one of the most skilled heroes on marvel earth. Danny's skill can easily be summarized in one of his quotes. "Where I was trained, they taught me that what matters isn't how often you hit your opponent----but how well!" However for story purposes Danny sometimes forgets his training due to fear, being enraged, or lack of focus. But when Danny remembers his training he focuses on the most effective places to strike the enemies. That line of reasoning isn't restricted to placement of punches and kicks, it included what style of combat is most effective. 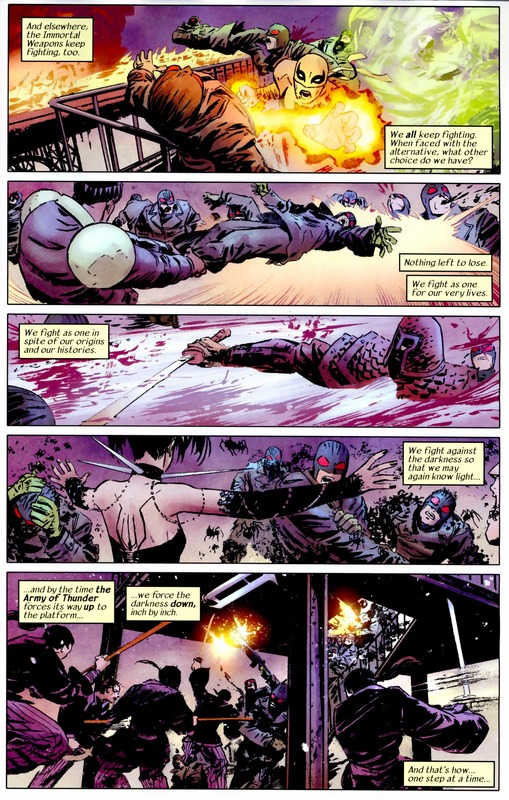 Such as the time he used Drunken Fist to counter move reading/telepathy (damn Mr X's inconsistent powers). Now allow me to narrow this information down to make it applicable to this fight. Starting off Danny will use Chi considering his opponent is armor clad with a sword that has over a six foot reach. If Danny want to do any effective damage he'll need to raise his level of striking power. This isn't anything new to Danny as he's done so during Spider Island, when civilians gained spider powers & in that commotion Danny punched Peter using chi. Which wasn't an isolated incident as he continues to do so (in his limited appearances). That should clear up Danny's use for chi even when restraining himself to knocking out an opponent. Considering Danny's chi enhances his speed Danny's chi strikes will be faster than sound. Which isn't a claim made by me inflating Danny's speed it's an on panel statement of a feat (scans below). As Danny's Iron Fist creates a concussion wave or shock wave (when a wave moves faster than the local speed of sound) that flattens everyone in the room. If we takes Luke Cages statement as credible Danny almost brought down the building (given Danny's current feats we could). But wait there's more as Danny reaction time is also raised to cope with the increased speed. Danny notes that training gives the microsecond needed to react. Now we could easily state this is hyperbole or Danny's absolute high end reaction feat. I might even be inclined to agree depending on how it's argued against. But this feat isn't easily dismissed as a character statement with Danny narrating an on panel feat. Which mean even if the feat isn't truly microsecond that still puts Danny in the millisecond margin, top tier speed among street level characters. So when it comes down to this fight I don't think either characters will land a hit on the first exchange (unless guts tanks). Regardless if Guts blitzes or they approach with mutual speed. Although I will conceded that Guts will put Danny in a difficult position early on. However that's when Danny's survival instinct will activate & he'll use a chi blast. Guts may have increased durability with his armor but he will still feel it undeniably dazed & thrown across the arena. Giving Danny seconds to dominate which is enough to maintain the advantage for the continued fight. The best course of action for Danny in that time will be to separate Guts form his sword, easily done with crippling blows to Guts' grip/arms. My primary concerns lie solely on Danny's Chi. His strength, speed, and durability can be matched and maybe exceeded by Guts, but we'll get into that later, Danny's Chi, particularly his offensive use of it, is what make him truly dangerous, but even with this advantage, there are still things to consider like . . Most of your concerns have been addressed but I'll go over it & make notes on where the info can be found (excuse the long post). 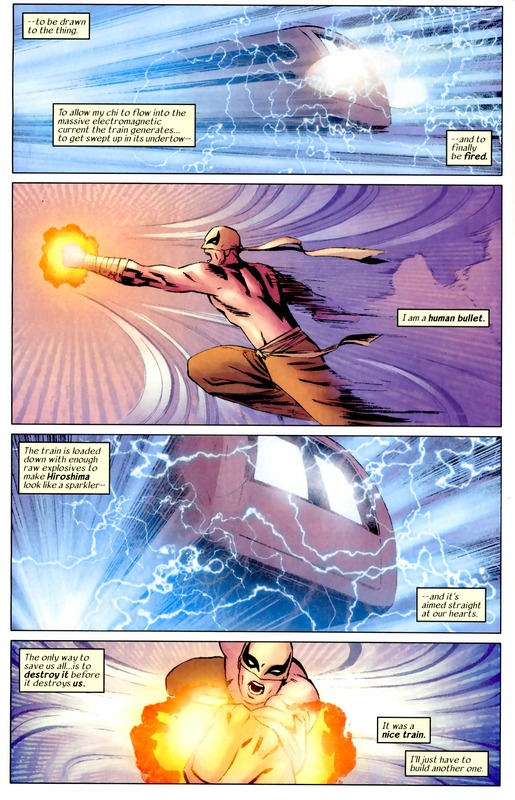 Danny has used excessive amounts of chi in one book alone, which was in Immortal Iron Fist 14 (Danny's train feat). While I'm hesitant to post scans of every use I will state I counted five as each fist counts for one. Also I'm sure Danny's iron fist limit was done away with as he has summoned enough chi to create a dragon & push a kinetic absorbing creature to its limits. I would state with confidence the last feat is considered spam. He also spammed chi in his fight with Black Panther, so I see no reason he would limited in peak condition at the start of a fight. Danny using chi against civilians with zero experience with powers that would take less effort than a Swordsman encased in armor. I'm not sure if this is a legitimate reason for Danny to hold back unless he purposefully underestimated his opponent. Danny did send Sue flying with a chi blast but she had the benefit of her force field. I would imagine Guts being rattled around in his armor. Also dodging the first one isn't possible as knowledge isn't given & set up is unnecessary. Blocking is plausible but that still sends Guts back & rattling him in his armor. Even the scans you've shown of Guts blocking supersonic strikes has him pushed back significantly & your statement of Guts' healing factor via armor notes he still breaks bones in spite the outer shell. A skilled fighter such as Danny would know this (even Hulk figured out internal injury). There's also this instance in Power Man and Iron Fist 90 where Danny says it physically and mentally drains him, but for some reason cbr won't controvert any images from the specific issue. but I'll just acknowledge this as just a relic from the past. Starting off Danny will use Chi considering his opponent is armor clad with a sword that has over a six foot reach. My concerns was never placed on the "if" of Danny using his Iron Fist or chi, but rather on the when. Yes, Danny has used theses abilities on enemies on both sides of the combat spectrum, from hapless thug w/ knife to genetic clone of a god, but in most cases there's still an escalation factor present. You say Danny will start off with chi thanks to Guts's appeal and weaponry, but whose to say he won't start with just his un enhanced strikes instead, it's not like Danny hasn't made this judgement before. Danny has chosen to fight Iron Man himself for several pages before even thinking of using his Iron Fist and even then it was more just because of him being Angry that Misty might have died. So if Iron Man can be afforded with such "generosity " why can't Guts? Even the scans you've shown of Guts blocking supersonic strikes has him pushed back significantly & your statement of Guts' healing factor via armor notes he still breaks bones in spite the outer shell. If hit with a instinctive chi blast, Guts should be able to block it off. I'm sure I've shown enough reaction feats to justify Guts is fast enough to do so.So the questions are: can Guts(and his sword) be able to block off the impact and, and how will he know the attack is coming. Guts should be able able to block off the over impact without as he's been able stay his ground while blocking off and locking swords with enemies capable of one shooting large boulders. and block off wooden beams thrown by monster who had previously shown he was able to throw those beams halfway through buildings. You seem to be using Guts's experience with Rosine as an example as to why he'll be pushed back by Danny's Iron Fist speed, but there's a huge disparity in these feats primarily that of weight. Rosine was probably cruising at about 110 pounds, and that not even counting the extra mass she'd probably got from her demonic transformation. That would make a world of a difference in impact compared to Danny what? 10 pound arm. Guts should be able to see the Iron Fist coming since instinctive or not it changes and still come with a tell tale glow. Thanks to the Iron Fist being mystical in nature, Guts's brand my also be able to warm him that's something is coming as it being to bleed when Guts's in contact with something mystical. Once it happens, Guts will do what he always do when attacked by something he's ignorant of and block it with his sword. Honestly this line of action my even help Guts in the long run, because now he'll be on the lock out for Iron and will no to avoid it rather than try to tank it block it off with his sword, saving his main life line in this battle. This should clear up any misunderstanding about Danny's chi use. First off it should be know that Danny received an amp/ungraded. 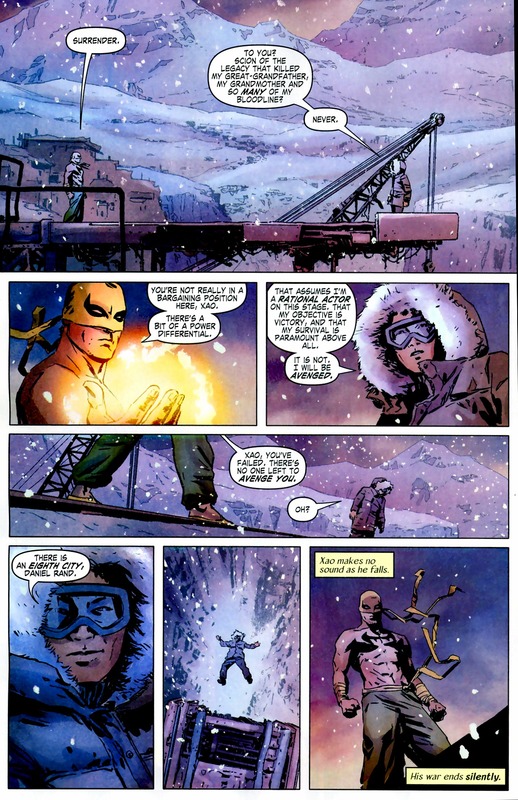 Note Danny's mention of heightened powers, heightened skill & heightened awareness (in Immortal Iron Fist 9). However that doesn't concluded the matter of how many times Danny can summon chi. As I've mentioned Danny does use chi continuously in Immortal Iron Fist 14 & by my count he uses it seven times. That is if we count each fist. I think the evidence you used betrays your reasoning. Iron Man is a known hero & more importantly Danny indicates he doesn't want to fight. Although when attacked he had no problem defending himself. While you are right about the reason why Danny use the Iron Fist your statement over looks his moral code. Which is to prevent needless death causing him to regret using the Iron Fist, having thought he killed Iron Man. Danny will not have that same qualm with fighting Guts as he gained control. Even if Danny were to get angry with Guts Danny would be justified in every situation. Dodging AOE will require Guts to have agility on par if not greater than Danny. Danny has two fist & his chi can be projected over medium distance. If Guts is the fighter I assume he is then he would only dodge far enough to deliver the next putting him in range of another chi blast. You appear to be confusing weight with force. Danny's chi can deliver over hundred tons of force noted by one shotting Ragnarok & the time he destroyed a Helicarrier. A renowned feat on the forums so I'll refrain from posting it. Danny's fist glowing wouldn't be an indicating sign of a chi blast, unless he neglected to use chi form the outset. But I've argued against that thoroughly. Considering Danny KOing, maiming, or killing Guts shouldn't be seen as unnecessary. If KO doesn't end the fight, & crippling isn't enough to force Guts to admit defeat. Then the only option left is for the fight to end with someones death. Why should that be Danny? I mean Danny isn't Peter (Spiderman) where his emphasis on not killing surpasses even his own safety. Moving on. The warning Guts has only extends to the nature of Danny's technique not its use. So blocking doesn't help as Danny's strikes (kicks included) delivers more force than Guts would expect . I would assume Guts is larger than Danny in stature but I can say for certain only Danny hits with the force of a giant. Not something to be gauged on looks. That would require him to encounter the first strike. But once Danny connects a chi amped strike or blast Guts will be in the wind. While Danny will be making effort to capitalize before he returned to the ground. This fight isn't about studying the opponent, it's about doing what it takes to win from the beginning. No half measures. think the evidence you used betrays your reasoning. Iron Man is a known hero & more importantly Danny indicates he doesn't want to fight. Although when attacked he had no problem defending himself. While you are right about the reason why Danny use the Iron Fist your statement over looks his moral code. Tony may have been connected with Colleen's kidnapping. Iron Man was getting several easy shots in and honestly had "gained control"
and yet with all this context and stakes, Danny doesn't used his Iron Fist until he is enraged at the chance of Misty's death. So I ask . .
Danny will not have that same qualm with fighting Guts as he gained control. Dodging AOE will require Guts to have agility on par if not greater than Danny. Danny has two fist & his chi can be projected over medium distance.If Guts is the fighter I assume he is then he would only dodge far enough to deliver the next putting him in range of another chi blast. Never said Guts would dodge a chi blast, but rather block it off with his sword. Even if Guts would go down a dodging route he most likely wouldn't just dodge but rather dodge along with a well placed throwing knife or mini bomb(s), as he is accustomed to doing. While dodging a follow up hit from a winged muscleman, Guts is able get a eye shot at the enemy behind him. He does this while also cutting off the muscleman's leg. Danny could obviously dodge or deflect this, but this isn't really about tagging him but rather breaking momentum and or concentration. I'm not confusing anything with anything. My comment wasn't aimed at the overall power of the Iron Fist, but rather your implication that it would just blast Guts away just by virtue of being supersonic due to his experiences with Rosine. I don't even think we were talking about an Iron Fist but rather a chi blast. Also, I'm sure Guts could tank an Iron Fist meant for a human of his stature, especially if the hit was restrained to knock him out. Regardless of it use, Guts's response will be the same. In the scans I used to accompany my reasoning, Guts didn't even know what was attacking him from behind but still block it off with his sword. As for Guts's assumption, once mystics are involves Guts plays it safe so once Guts is warned he'll most likely brace himself accordingly. But once Danny connects a chi amped strike or blast Guts will be in the wind. While Danny will be making effort to capitalize before he returned to the ground. I guess I'll use this as a segway for The Berserker Armor, because if Guts does take a hit he'll go. . . Berserk. So lets start off with "What the hell is the Berserker Armor ?". This is something answered in the aptly titled chapter "The Beserker Armor" . . ."Part 1"
Essentially it's a limit remover, it allows the wearer to move and fight at levels humans can't and makes him unable to feel pain. The price for such power is a life threaten strain on the user muscles and being unable to distinguish friend from foe. Please note that the detrimental effects on the muscles don't become prevalent until the battle is over and Guts calms down. The armor also comes with a very makeshift healing factor that both mend wounds and also reinforces the body with steel making it stronger than it was before. Unlike the effects on the muscles the reinforcement on the bones would be felt the longer Guts continues to take damage, but thanks to Guts's enhancements, he may not need it. Because the Berserker armor, Guts's speed gains a tremendous boost. Now he can casually back flip away from supersonics attack while already in mid air . What's most impressive about that is Guts was able to accomplish this without any footing. Whats more Guts is able to match and honestly overwhelm the supersonic attack above. Contrary to popular belief Guts being a Berserker doesn't make him mindless but rather fearless and instinct driven. He still lucid enough to know to dodge or block attacks as the scans above have already shown. With these attribute, along with others, Danny may be hard press to hit Guts, while Guts will be able to peel away his stamina until the cuts finally come in. I'm not seeing how the scans I've shown contradicts my arguments or how my statement over looks anything. Difference of opinions I would assume. The scans perfectly illustrates that just because an enemy is coated in armor doesn't mean Danny will just break out his Iron Fist, he'll still fight normally for a period, and as for Iron Man being a known hero, there's noting to illustrates that Danny knew that. Considering this hasn't settled means if I continue any further we will be debating in circles. I'm not to fond of that idea, so I offer more evidence to support my points. However I'm not going to reinforce my previous points on the issue of the armor & simply agree to disagree. Although the sword is an entirely different issue & one Iron Fist has faced before among his very at the start of his career. So the strategy I'm presenting is rather old knowledge to Danny. Before receiving his own book Danny got his start in "Marvel Premiere" in that run Danny faced a Ninja of comparable skill & was faced with the same difficulties Guts presents a sword wielding foe. Now Guts on the other hand takes that concept & turns it to eleven. Guts has armor he won't yield to simple blows (addressed) & the most important thing his weapon is a sword that measures longer than Danny's height. This advantage can be ascertained with a glance of the characters. Taking the fight seriously Danny's objective would be to level the playing field. Which is why Danny will use chi. I'm going to skip this because this isn't pertinent to the debate with it only addressing plot. Which is hard to form an opinion on if you're looking in form the outside. and yet with all this context and stakes, Danny doesn't used his Iron Fist until he is enraged at the chance of Misty's death. So I ask . .why? This still relates to the points addressed above. I would hope my reasoning is sufficient. But I'll understand if you agree to disagree. Danny's consecrations with the use chi should be considered reflex/instinct at this point. Danny stated he healed without thinking about it & later demonstrates chi blast or Iron Fist while mediating. The latter of which Danny considers complex from his statements. I'm not confusing anything with anything. My comment wasn't aimed at the overall power of the Iron Fist, but rather your implication that it would just blast Guts away just by virtue of being supersonic due to his experiences with Rosine. I don't even think we were talking about an Iron Fist but rather a chi blast. I have no doubts Danny chi blast is faster than sound also. Plus with the power output shown in Danny's spar with Sue he was able to blast her across the building with her shield activate. Not to say his did any amount of damage to her but the feat displays power beyond a grenades capabilities. We have the feat of him blasting a room full of ninja back with AOE created from chi, something Danny can replicate. Also, I'm sure Guts could tank an Iron Fist meant for a human of his stature, especially if the hit was restrained to knock him out. I agree. But that isn't what my statements were implying, so I'm not sure what this is meant to address. I'm not trying to twist your statements & imply more than you're stating. But it seems to me Guts will move in on the defensive once chi comes into play. In my previous statements I was clear neither character would land a blow from their first exchange. If my reasoning is to be believed that would considerably narrow down the events of this fight. But more on that later. Why does this feel as if Guts is the moving the goalposts? Anyway that would only be a factor if Guts was in favorable circumstances position before. After receiving a hit that lunches Guts, he would be out matched in agility. With that the enhancements of the Berserk armor wouldn't apply at that time so Guts will be dazed from Danny's chi strike (which can come in any form). So dodging isn't a plausible means of escape. This sounds dangerous but I understand you point. Although Guts is still at a disadvantage in blood loss taken from the scan posted. Unlike the effects on the muscles the reinforcement on the bones would be felt the longer Guts continues to take damage, but thanks to Guts's enhancements, he may not need it. Because the Berserker armor, Guts's speed gains a tremendous boost. Now he can casually back flip away from supersonics attack while already in mid air. This is a very good example speed & agility but not enough to compare to Danny. Danny's agility allows him to contort his body while falling, & grappling to remain on his feat. Also when faced against characters that have comparable agility if not greater Danny knows how to set up his next strike. Such as when he faced Spider Man. Meaning the possibility of Guts dodging mid air isn't something. Danny hasn't faced form a superior opponent. As I've mentioned before Guts dodging doesn't put him out of range for another chi blast. When they both finally come to terms with each other's speed & agility it will be long Guts uses the full extent of the Berserk armor. If they are both dodging waiting for an opening there is bound to be one that both are willing to commit to & suffers a graze/scrape. In that scenario Guts has the advantage of reach but not of range as chi blast extends even further than Guts' sword. I know this is sudden but I don't want to leave this unfinished. So to excuse for my poor conduct you should have the final post. Note this is my analysis of the debated on points so anything further I will not be able to address. Danny approach to Guts will be precise dominate the opponent using the skills & abilities within his mean. Guts at the start of this will have to key advances his Sword & his armor, while Danny will have chi. This makes Danny the underdog but also the most dangerous. I assume neither characters will character in recklessly, so dodging will be an extended portion at the start of the battle. However neither have the patients for a deadlocked battle, so they'll take the risk & that's where Danny comes out on top. Gut's isn't aware of chi blast nor the force behind it. That will push Guts back dazing him enough, allowing Danny then land a free strikes using skill & superior agility. That sets up for the options Danny will have KO his armored opponent or injure him enough he drops his sword. By ThatGuyWithHeadPhones' statements Guts will not be making full use of berserk armor before this point. Which means Danny options are easily easily accomplished with chi. I'm not say this match is one sided but I wouldn't debate this if I can't see away Danny will win. Honestly using the instance with the ninja only exacerbate your point and supports mines, because even when Danny is place against an enemy with a larger reach, above Danny's height as you put it, Danny still opted to fight with none enhanced blows until he had felt he had exhausted other options. Danny didn't even think of disarming him until the a** end of the fight. I'm not sure how this refute my point of breaking momentum. Danny use of chi is reflexive and instinctive so when Guts throws a knife at his eye while dodging the first chi shot, his instincts who most likely opt to deflect the throwing knife as it's a more discernible danger. Gut would be able to use that to gain so breath. I have no doubts Danny chi blast is faster than sound also. Nothing you've shown really shows that. *across a room. Considering Danny's placement in the scan, it wasn't a far launch at all. Not to say his did any amount of damage to her but the feat displays power beyond a grenades capabilities. We have the feat of him blasting a room full of ninja back with AOE created from chi, something Danny can replicate. Nothing Guts hasn't took on purpose before. *note each ofthese beast are capable of sinking 10 battleships, albeit battleships circa 1500's but still. . .
Also the ninjas in the scans just seem to have lost their footing, no one seems all that effected beyond that. There's no "dazed" with the Berserker armor only a feral instinct driven blood lust. When Guts put it on for the first time, it was following receiving a life threatening cut across the chest, and then being savagely beating while suffering from said injury. Despite all this, the moment Guts actually used it this is what happen. Despite being almost unconscious and physically unable to even put on his armor, the moment Guts puts his armor he made visceral mince meat out of a demon. So when, or if, Danny manages to blast Guts away, when he jumps up to continue his assault, instead of the dazed opponent he thinks he'll be encountering, he'll instead be immediately trying to counter against a supersonic sword swing. Although Guts is still at a disadvantage in blood loss taken from the scan posted. Blood lost only occurs adjacent to the amount of damage taken, and I don't think Guts will be taking too much damage. While what you've shown certainly exceeds Guts on technical level, it doesn't really seem all that fast. Sure Danny is able to do more flips and couture his body better, but Guts is able to fight and move away at supersonic speeds. Technically or not, Guts should be able to move away. The Spider-Man scans also don't seem all that applicable to this situation, yeah he managed to hit Peter, but it had nothing to do with countering an opponent utilizing their agility but rather a example of Danny's great use of stealth, which isn't much of an option here. In the end, I was never convinced in Danny's using his Iron Fist early in the match, which will give Guts some major leeway in the beginning. I also wasn't convinced in Danny's ranged abilities doing any significant damage to Guts because of Guts's overall endurance and using his sword as a shield. What I was convinced in was that Guts, being an able to fight normally for 2 or 3 days without rest, combined with a armor that essentially makes him fights will a most likely out lost Danny. I was convinced that, thanks to his armor, that once Guts takes any legitimate damage Danny will soon be hard pressed to get a decent shot on Guts for the rest of the match, and as time goes on, Danny's stamina will start to wane while Guts will still be fight with an extreme amount of vigor and ferocity, and that's how he'll win. Just peel Danny stamina away. @thenaughtytitan: @kingh: @elijah_c_washington: @llehdevil: @joewell911: @linsanel_doctor: @great_black_star: @leo-343: Users that asked for callout. @mr_ingenuity: Remind me in about 10 hours, at around 3 please. I will give my vote after 3 hours, got a work to do, and have to read the last round. @mr_ingenuity: @thatguywithheadphones: I'm back! And I must say this was a great debate! Props to both sides! That being said, I'll have to give my vote to TGWHPS and Guts. While both fought well, Headphones was just more convincing in my opinion. 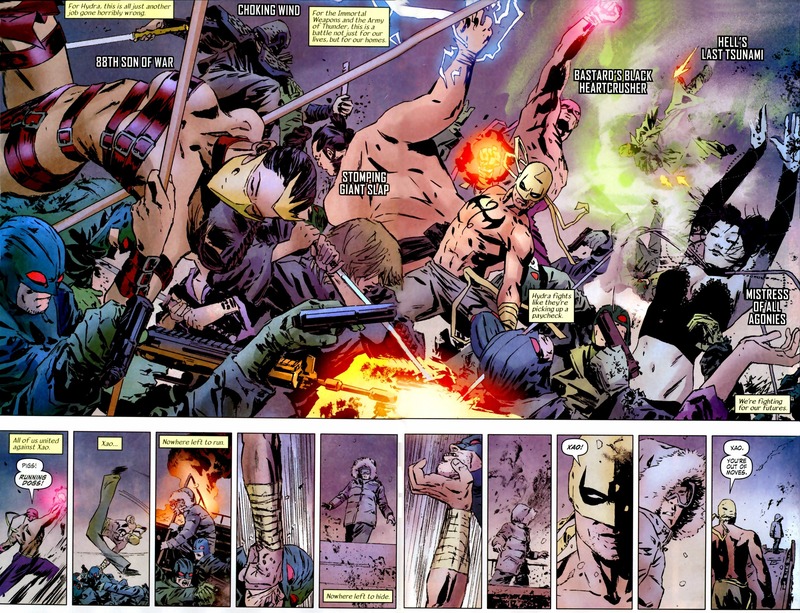 To be specific, I felt his points on Iron Fist not going all out at first and Guts' durability/endurance/Berserker armor were especially potent and proved that Guts could get some hits in before chi was used and could keep fighting after the assault with the armor, if he didn't dodge. But like I said, good on you both! @mr_ingenuity:How do you want to cap this? @thatguywithheadphones: 2 week open vote I would suggest. Although I'll leave it up to you. Good read, I enjoyed it. Gonna have to back TGWHP on this one. I was more convinced with his stance on Guts' speed and reactions than I was with Mr_I and his stance on Danny's. The moral compass point was also well argued. @thatguywithheadphones: Get's my vote, I felt his counters were better, and that he has a light control over the whole debate. Nice Job. Gonna go with Mr. Ingenuity. Convinces me that Iron Fist is more logical. This assassin easily maneuvered, counterattacked with kicks and even broke his sword in half. Guts wasn't having any of it. He completely outpaced him, blocked and countered all of his attacks and wasn't even trying............ If he can counter someone with this much agility and skill i don't see why Guts couldn't have potentially dealt with Danny's agility. Guts destroyed an entire group of people just like him. Completely outpaced, blitzed and danced around these renown assassins. To add to your argument of his agility and his ability to dodge you could have shown the time where he was moving around so fast and dodging around so easily that he purposely made enemies hit each other. All while injured. And i felt strength wasn't emphasized enough. With a sword that size, with that much weight(it has been measured anywhere between 300 to 700 pounds) if Danny gets hit even once, even he could get killed easily. But let's not turn this into a respect thread. My vote goes to @mr_ingenuity he stuck with his advantages, while @thatguywithheadphones kept focusing on whether or not Danny would start off swinging, then whether or not Guts could win the fight. 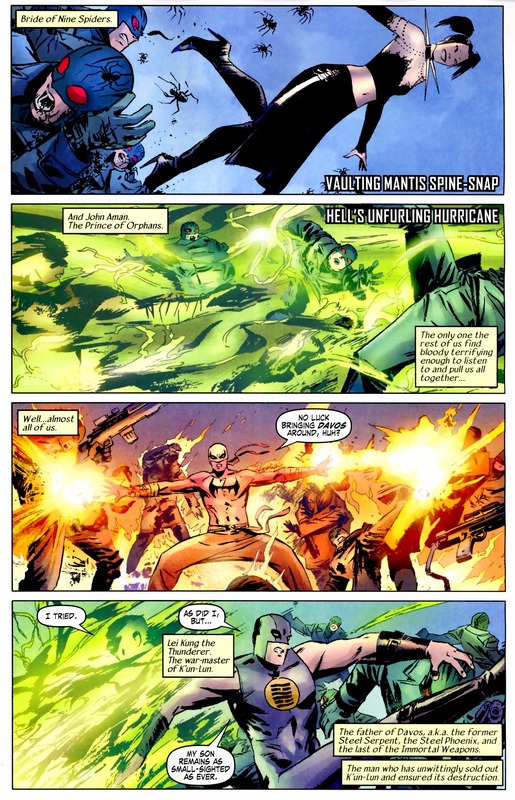 My vote ultimately goes to @mr_ingenuity, who was able to emphasize on Danny's Skill advantage as well as utilize the versatility of the Iron Fist in such a way that he was able to open up more (simultaneous) avenues of victory than Guts could effectively counter at once, proving Danny would eventually overwhelm him.